Only one more day until Thanksgiving. Is everything ready at your house? Earlier this week, I posted some helpful tips for children for Thanksgiving and many people emailed me to ask for resources and activities for children. As I was searching for fun activities for children (and making a few of my own!) I found the most adorable printables that will delight both children and adults at Thanksgiving this year. The best part is that this printable is free! 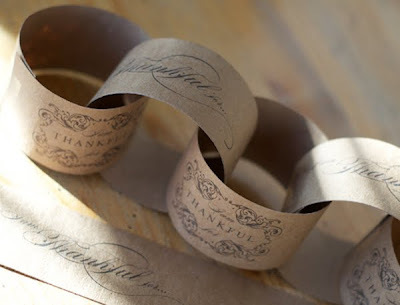 The printable chain of thanks from Silverbox allows each guest to write words of thanks on a strip of paper. Here's how I plan to use this gorgeous template. Each guest will receive a strip of paper at the place setting, used as a unique and elegant napkin ring. Before dinner has ended, guests will write their messages of thanks and the slips will be read aloud. My daughters will then glue the strips (using double sided tape) into a garland that will decorate the living room. Everyone in the family is involved in this special activity. I have a feeling that this is going to become a tradition. Click here for the template. Silverbox has so many beautiful creations! How will you use these beautiful designs? What family traditions do you have to give thanks on Thanksgiving? Pictures and links from Silverbox. We have our gratitude tree in our breakfast room with leaves we write on. But... I may use this pas a garland on a small tree at Chriatmas! No traditions here. We just love to EAT! Have a wonderful Thanksgiving!